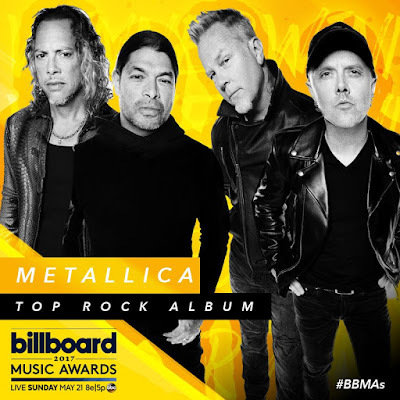 Metallica’s “Hardwired…To Self-Destruct” was named Top Rock Album Of The Year at the 2017 Billboard Music Awards in Las Vegas on Sunday evening. The band’s tenth studio release took top prize in the category ahead of fellow nominees Radiohead, The Red Hot Chili Peppers, The Lumineers and Twenty One Pilots. Billboard Music Awards nominees are based on key fan interactions with music, including album and digital songs sales, streaming, radio airplay, touring and social engagement. These measurements are tracked year-round by Billboard and its data partners, including Nielsen Music and Next Big Sound. The awards are based on the reporting period of March 18th, 2016 through March 16th, 2017. Metallica were also nominated in the Top Rock Artist category, but lost out to Twenty One Pilots. “Hardwired…To Self-Destruct” debuted at No. 1 on the US Billboard 200 last November and recently achieved platinum status in the US for sales of 1 million copies. Metallica are currently enjoying a two-week break from a North American tour in support of the album; they’ll return to action at Busch Stadium in St. Louis, MO on June 4.